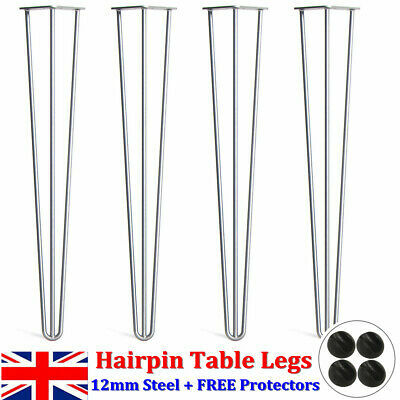 4x Premium Hairpin Table Legs + FREE Screws, Guide, AND Protector Feet Worth £8! 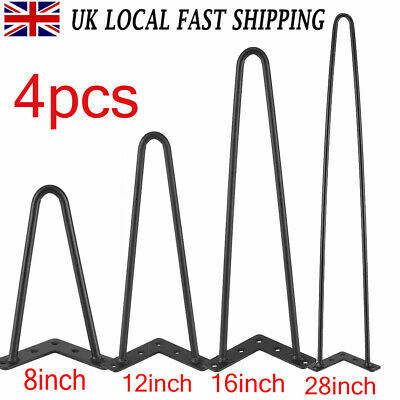 Europe's #1 Hairpin Specialist - 40,000 Legs in Stock! 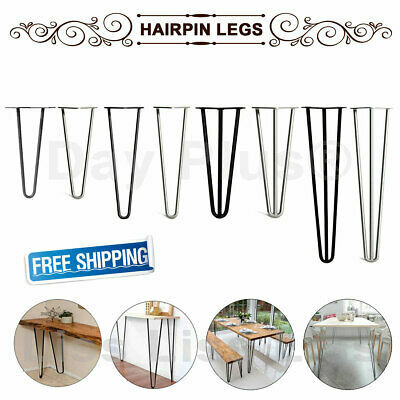 Seller: thehairpinlegco (5,396) 100%, Location: MALMESBURY, Ships to: Worldwide, Item: 321836913196 The Hairpin Leg THE HAIRPIN LEG CO. BUY NOW The UK and Europe's BEST SELLING hairpin legs. Top rated for quality and customer service, 4 years running. 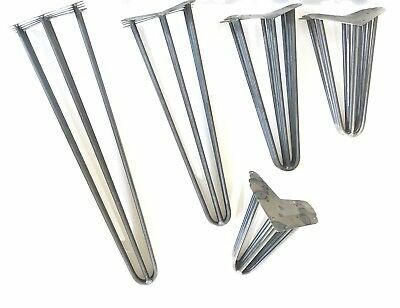 STRONGEST LEGS on the market, with authentic double welding. Strong enough to hold 120kg (the weight of a baby elephant)! Engineered to strict ISO 9001 QUALITY STANDARDS with certified materials for an unbeatable build. A true DESIGN CLASSIC – our pins are modelled closely after the originals created by Henry Glass in the 1940s. 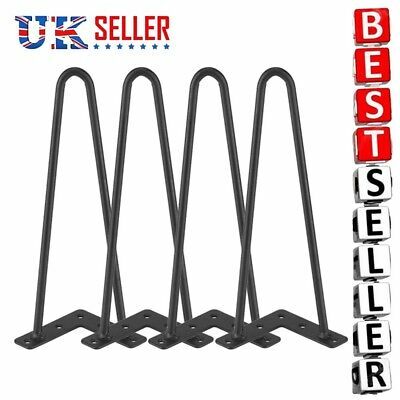 The most SECURE FIXING – 30% thicker base plate and more fixing holes than most other manufacturers'. FREE NEXT DAY DELIVERY 1hr Delivery slots with most items dispatched same day. SCREWS AND FEET INCLUDED Free wood screws and floor protectors. PROFESSIONAL FINISHES Stop rust and add style. 11 options to choose from. ROBUST ENGINEERING Unbeatable build quality and construction. FURNITURE GRADE Made from only the highest quality cold-formed steel. THE LEGWORK VIDEO : MAKING THE PINS. FINISHES We have 11 professional finishes for you to choose from. 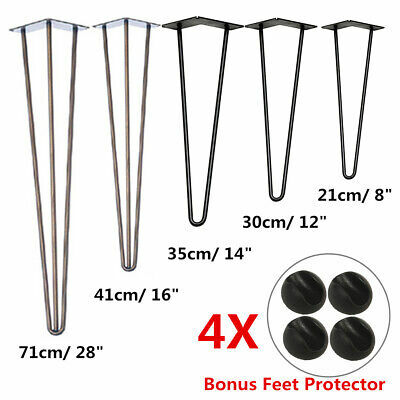 They look great, are extremely durable and will protect your legs from rusting. We also offer a 100% natural, raw steel option. RAW STEEL 100% natural and bare. It will rust, even indoors but it's perfect for people who want to finish the legs themselves or want an industrial, rusted look. SILVER The steel is electro-treated with zinc to produce an extremely robust finish, rust proof finish that is even suitable for outdoor use. A perfect pairing for stainless steel. 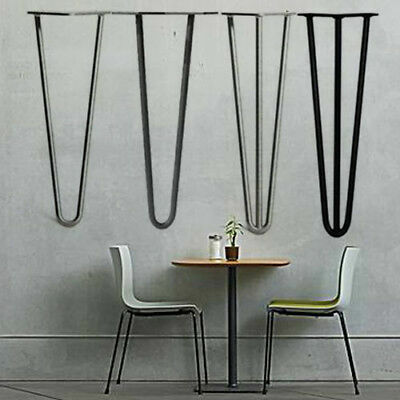 CLEAR POWDER COAT Gives a more industrial raw steel look without it turning rusty over time. Clear coat adds a slight sheen to the metal. 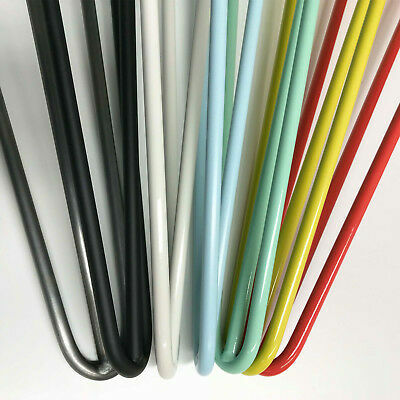 COLOUR POWDER COAT Available in black, white and a range of vibrant colours. Powder coat protects your legs from rust while adding a pop to your project. 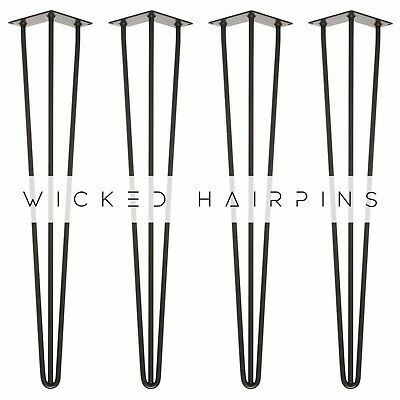 COPPER Copper hairpins give a very striking modern look. This is real copper and will age and develop a beautiful patina over time. CHROME Fancy something shiny? Our chrome is polished to a mirror finish and goes great with a dark top. Delicate floors? No worries. 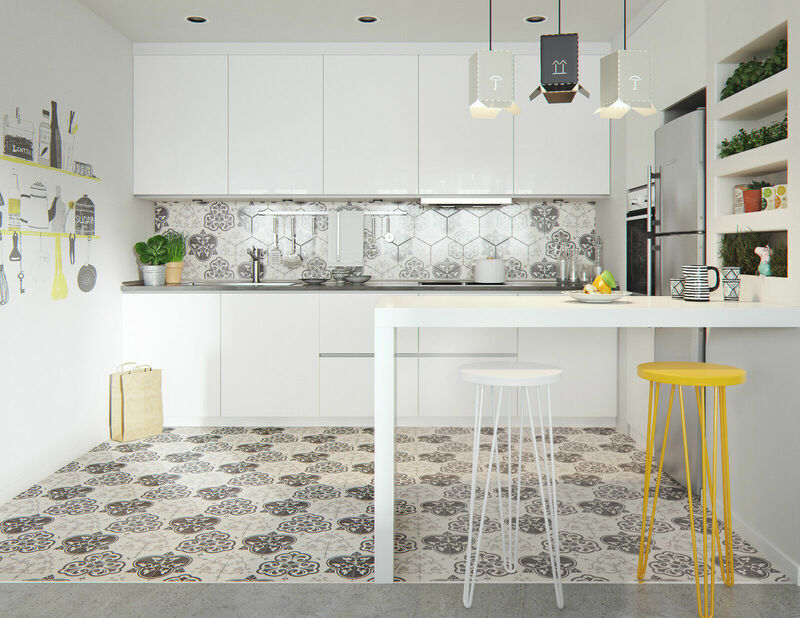 Stop damage on delicate floors, and slipping on stone, with our free clip-on floor protector feet. Colour-matched and included with every set of legs. Screws Included Screws included - 16 x 20mm woodscrews included so you can get started right away! 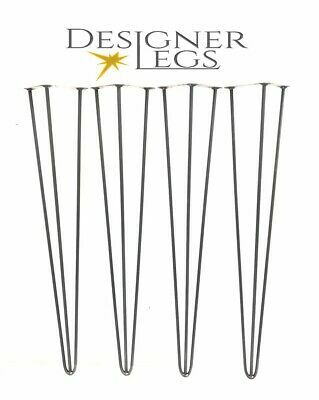 LEG SELECTOR To help you choose the correct legs, click on the piece of furniture below which is closest to your project. 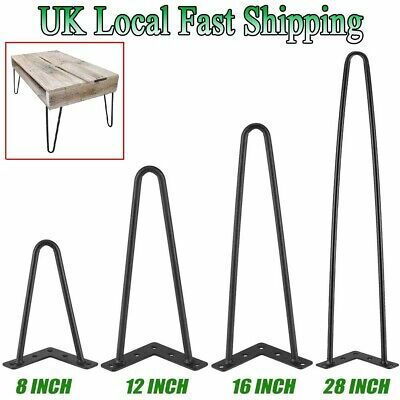 Cabinet Media Stand Sideboard Coffee Table Side Table Bench Console Table Desk Dining Table Counter Top Bar or Poseur CABINET We recommend 4 inch, 2 prong, 10mm. These small furniture feet are the perfect addition for wardrobes, sofas, drawers or any piece that requires a low foot. 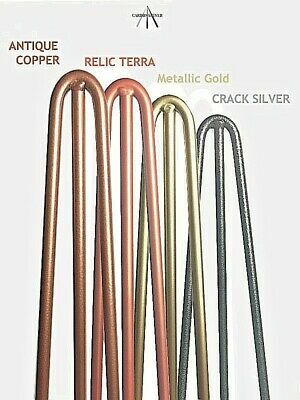 We make these in a 10mm, 2 prong version. They are incredibly strong and will support the very heaviest cabinets many times over (well over 200kg). 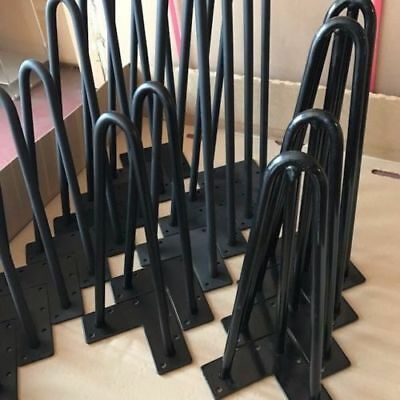 Technical Specification Furniture: 4 Inch / 100mm 4 Inch / 100mm 8 Inch / 200mm 10 Inch / 250mm 12 Inch / 300mm 14 Inch / 355mm 16 Inch / 400mm 28 Inch / 710mm 34 Inch / 860mm 40 Inch / 1010mm Base Size: 110x110mm; 6mm holes Availabile Finishes: Steel Diameter Prongs Max Weight 10mm 2 prongs 250kg Steel Diameter 10mm Prongs 2 Max Weight 250kg MEDIA STAND We recommend 4 - 14 inch, 2 prong, 10mm. The exact size required will depend on your furniture and final working height of item on top . 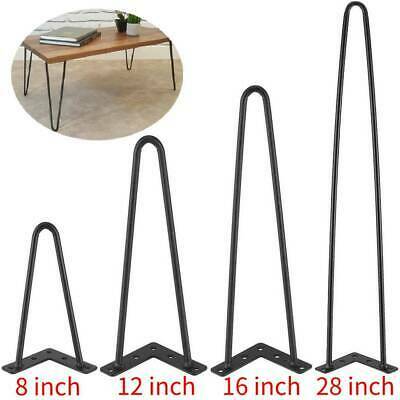 Most TV stands have legs around 8 or 10 inches. We make these in a 10mm, 2 prong version. They are incredibly strong and will support the very heaviest cabinets many times over (well over 200kg). 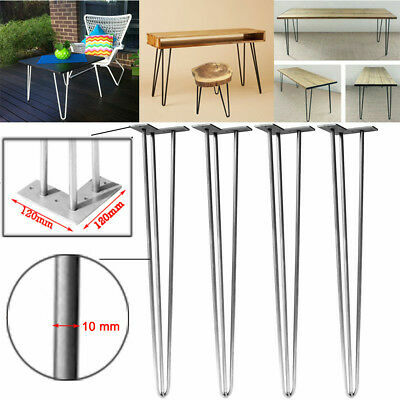 Technical Specification Furniture: 8 Inch / 200mm 4 Inch / 100mm 8 Inch / 200mm 10 Inch / 250mm 12 Inch / 300mm 14 Inch / 355mm 16 Inch / 400mm 28 Inch / 710mm 34 Inch / 860mm 40 Inch / 1010mm Base Size: 110x110mm; 6mm holes Availabile Finishes: Steel Diameter Prongs Max Weight 10mm 2 prongs 250kg Steel Diameter 10mm Prongs 2 Max Weight 250kg SIDEBOARD We recommend 10 - 16 inch, 2 prong, 10mm. 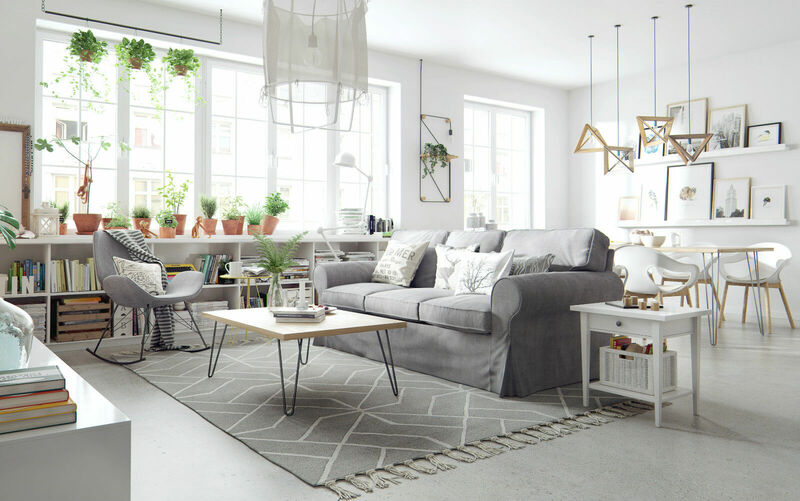 Sideboards can have a huge range of styles, but if you are unsure we recommend choosing legs which position the top surface of the sideboard between 60 - 80cm above the floor. The G Plan sideboards usually take a 10 or 12 inch leg. We would always suggest 10mm legs for your sideboard. 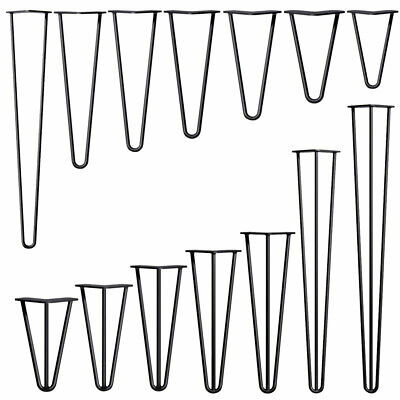 Choosing whether you want 2 prong or 3 prong comes down to your visual preference. Both will be strong enough for sideboards up to 200kg.. Technical Specification Furniture: 10 Inch / 250mm 4 Inch / 100mm 8 Inch / 200mm 10 Inch / 250mm 12 Inch / 300mm 14 Inch / 355mm 16 Inch / 400mm 28 Inch / 710mm 34 Inch / 860mm 40 Inch / 1010mm Base Size: 110x110mm; 6mm holes Availabile Finishes: Steel Diameter Prongs Max Weight 10mm 2 prongs 250kg Steel Diameter 10mm Prongs 2 Max Weight 250kg COFFEE TABLE We recommend 10 - 14 inch, 2 prong, 10mm. Coffee table tops generally sit 14 inches above the ground. However, some larger tables sit a little lower, down to around 10 inches. 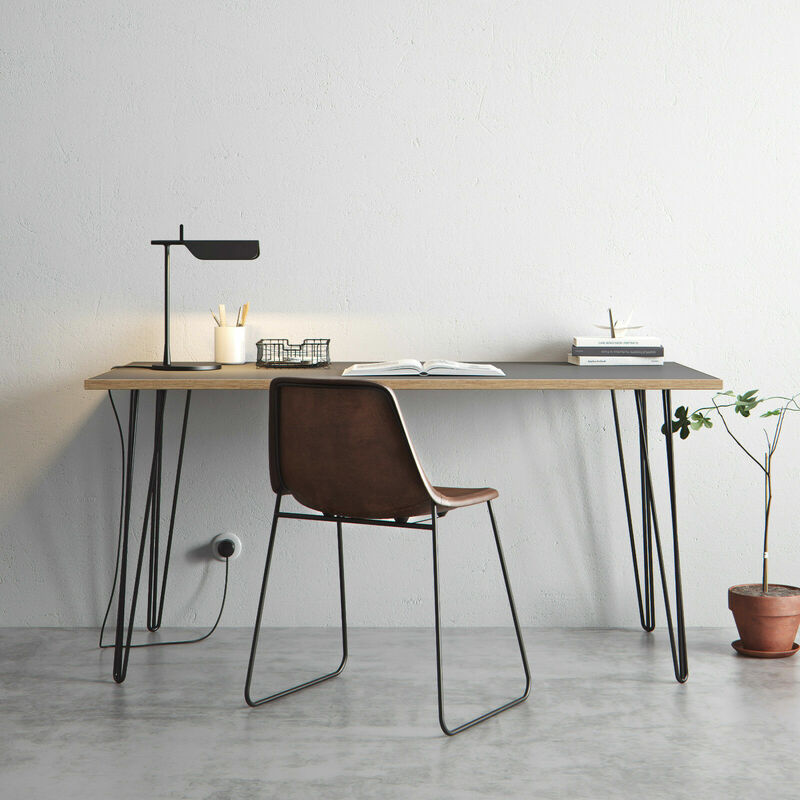 The 10mm 2 prong version is more than strong enough for all coffee tables up to 200kg. Technical Specification Furniture: 12 Inch / 300mm 4 Inch / 100mm 8 Inch / 200mm 10 Inch / 250mm 12 Inch / 300mm 14 Inch / 355mm 16 Inch / 400mm 28 Inch / 710mm 34 Inch / 860mm 40 Inch / 1010mm Base Size: 110x110mm; 6mm holes Availabile Finishes: Steel Diameter Prongs Max Weight 10mm 2 prongs 250kg Steel Diameter 10mm Prongs 2 Max Weight 250kg SIDE TABLE We recommend 16 inch, 2 prong, 10mm. 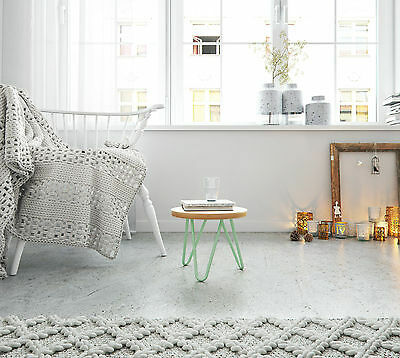 Side tables or bed side tables usually sit around 16 inches high. We would suggest the 10mm version in 2 prong, however the 3 prong is also available if this is your visual preference. Both versions will hold up to and above 200kg. 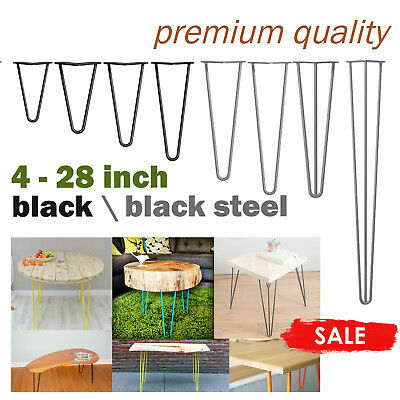 Technical Specification Furniture: 14 Inch / 355mm 4 Inch / 100mm 8 Inch / 200mm 10 Inch / 250mm 12 Inch / 300mm 14 Inch / 355mm 16 Inch / 400mm 28 Inch / 710mm 34 Inch / 860mm 40 Inch / 1010mm Base Size: 110x110mm; 6mm holes Availabile Finishes: Steel Diameter Prongs Max Weight 10mm 2 prongs 250kg 10mm 3 prongs 250kg Steel Diameter 10mm 10mm Prongs (recommended) 2 3 Max Weight 250kg 250kg BENCH We recommend 16 inch. Our legs can be used from single seater benches up to benches of 6 people or more. 10mm, 2 Prong - Suitable for up to 2 people. 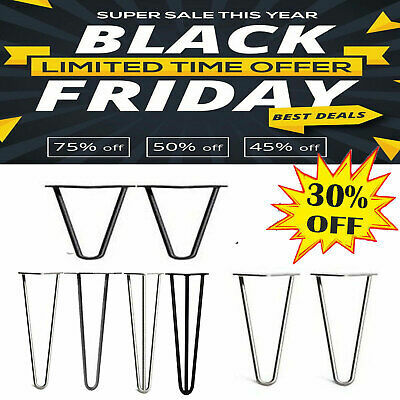 12mm, 2 Prong - Suitable for up to 3 people. 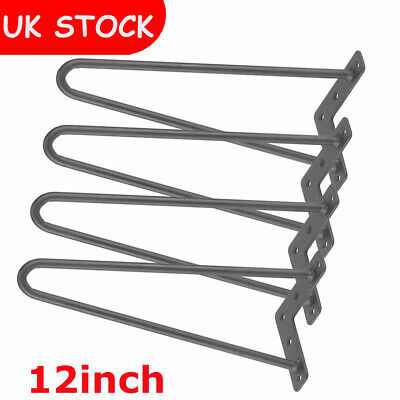 10mm, 3 Prong - Suitable for up to 5 people. 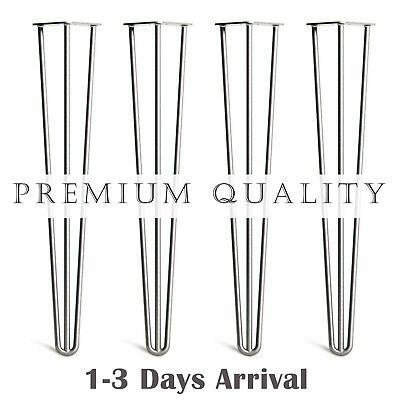 12mm, 3 Prong - Suitable for up to 6 people or more. Technical Specification Furniture: 16 Inch / 400mm 4 Inch / 100mm 8 Inch / 200mm 10 Inch / 250mm 12 Inch / 300mm 14 Inch / 355mm 16 Inch / 400mm 28 Inch / 710mm 34 Inch / 860mm 40 Inch / 1010mm Base Size: 110x110mm; 6mm holes Availabile Finishes: Steel Diameter Prongs Max Weight 10mm 2 prongs 140kg 2 people 12mm 2 prongs 250kg 3 people 10mm 3 prongs 250kg+ 5 people 12mm 3 prongs 250kg+ 6 people Steel Diameter 10mm 10mm 12mm 12mm Prongs 2 3 2 3 Max Weight 140kg 2 people 250kg 3 people 250kg 5 people 250kg 6 people CONSOLE TABLE We recommend 28 inch, 2 prong For tables that you are not working or eating at, you can choose any 28” leg, 2 or 3 prong, 10mm or 12mm. 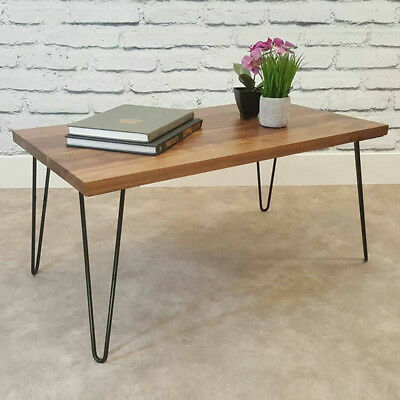 For a console table we think the 28 inch, 2 prong legs in 10mm legs are best. For light tables the 2 prong legs work well. 10mm is ok for up to 15kg and 12mm for up to 25kg. 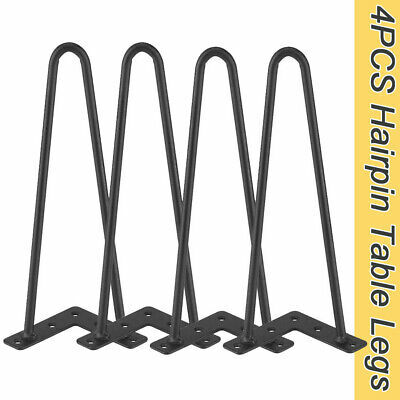 For heavier tables we suggest choosing a 3 prong leg. The 10mm verison will take up to 60kg while the 12mm will support 120kg+. 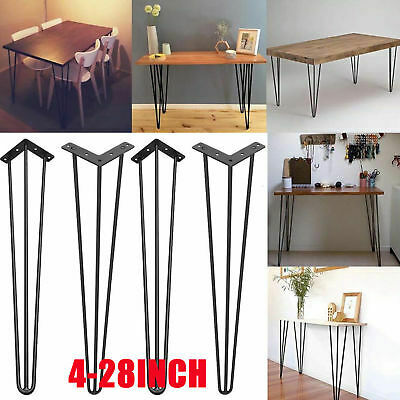 Technical Specification Furniture: 28 Inch / 710mm 4 Inch / 100mm 8 Inch / 200mm 10 Inch / 250mm 12 Inch / 300mm 14 Inch / 355mm 16 Inch / 400mm 28 Inch / 710mm 34 Inch / 860mm 40 Inch / 1010mm Base Size: 110x110mm; 6mm holes Availabile Finishes: Steel Diameter Prongs Max Weight 10mm 2 prongs 15kg 12mm 2 prongs 25kg 10mm 3 prongs 60kg 12mm 3 prongs 120kg Steel Diameter 10mm 12mm 10mm 12mm Prongs 2 2 3 3 Max Weight 15kg Side table 25kg Small desk 60kg Normal desk 120kg Heavy desk DESK We recommend 28 inch, 3 Prong*. 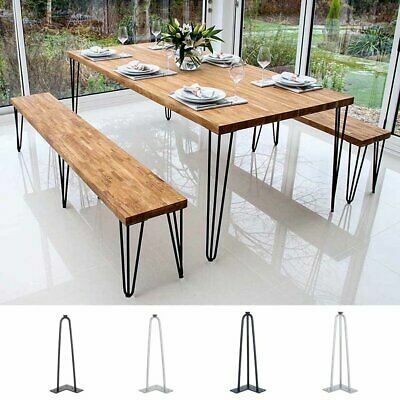 Whenever you intend to work at the table, we suggest using 3 prong legs. 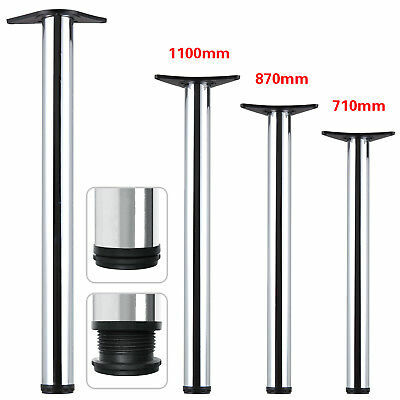 The 10mm versions are suitable for a weight of up to 60kg while the 12mm versions are suitable for 120kg or more. 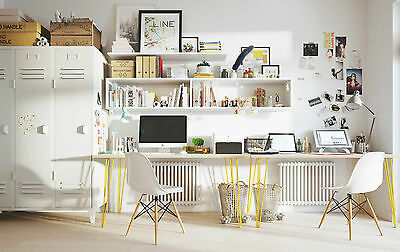 * Prefer the 2 prong look and only have a small desk (up to 25kg)? No problem, the 12mm 2 prong legs will work just fine for this. 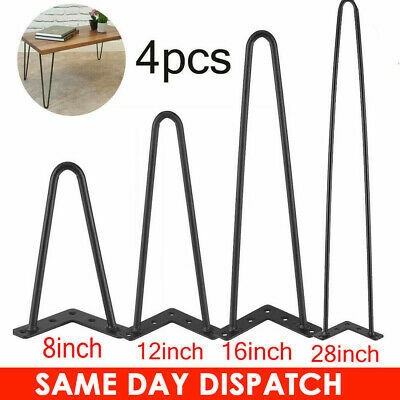 Technical Specification Furniture: 28 Inch / 710mm 4 Inch / 100mm 8 Inch / 200mm 10 Inch / 250mm 12 Inch / 300mm 14 Inch / 355mm 16 Inch / 400mm 28 Inch / 710mm 34 Inch / 860mm 40 Inch / 1010mm Base Size: 110x110mm; 6mm holes Availabile Finishes: Steel Diameter Prongs Max Weight 10mm 2 prongs 15kg 12mm 2 prongs 25kg 10mm 3 prongs 60kg 12mm 3 prongs 120kg Steel Diameter 10mm 12mm 10mm 12mm Prongs 2 2 3 3 Max Weight 15kg Side table 25kg Small desk 60kg Normal desk 120kg Heavy desk DINING TABLE We recommend 28 inch, 3 prong*. 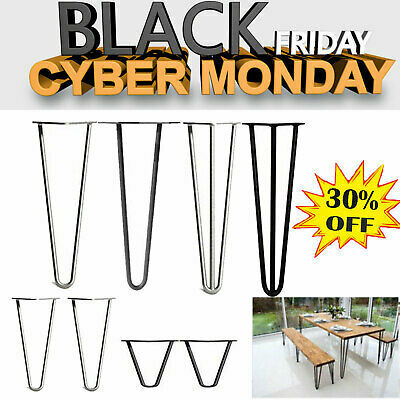 Whenever you intend to work or eat at the table we suggest using 3 prong. 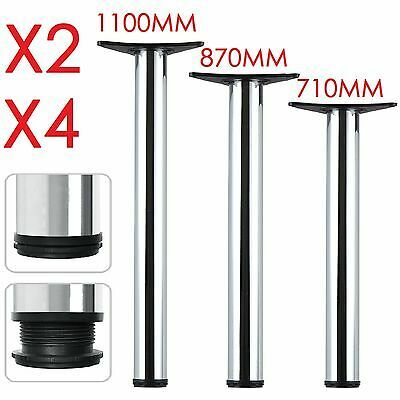 The 10mm versions are suitable for a weight of up to 60kg while the 12mm versions are suitable for 120kg or more. * Prefer the 2 prong look and only have a small desk (up to 25kg)? No problem, the 12mm 2 prong legs will work just fine for this. 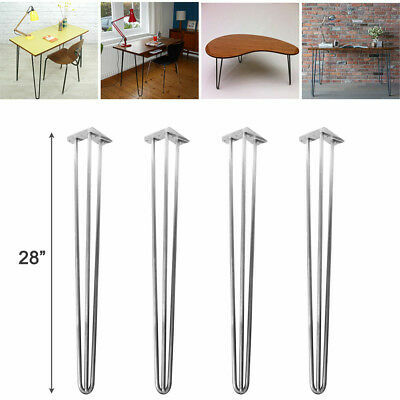 Technical Specification Furniture: 28 Inch / 710mm 4 Inch / 100mm 8 Inch / 200mm 10 Inch / 250mm 12 Inch / 300mm 14 Inch / 355mm 16 Inch / 400mm 28 Inch / 710mm 34 Inch / 860mm 40 Inch / 1010mm Base Size: 110x110mm; 6mm holes Availabile Finishes: Steel Diameter Prongs Max Weight 10mm 2 prongs 15kg 12mm 2 prongs 25kg 10mm 3 prongs 60kg 12mm 3 prongs 120kg Steel Diameter 10mm 12mm 10mm 12mm Prongs 2 2 3 3 Max Weight 15kg Side table 25kg Small desk 60kg Normal desk 120kg Heavy desk COUNTER TOP We recommend 34 inch, 3 prong. 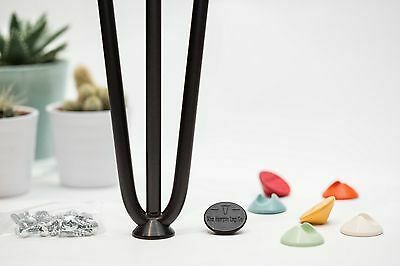 At kitchen counter top height, the 3 prong legs are required to give you the stiffness required for working or eating on the table. 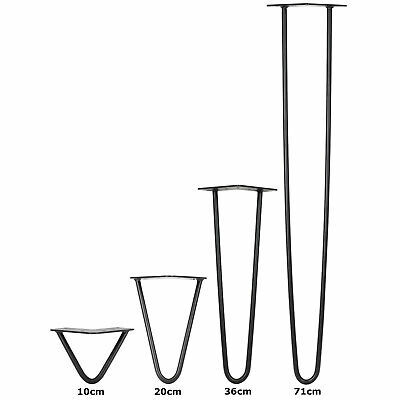 The 10mm legs work well up to around 30kg, more than this then we suggest using 12mm, which are good to approximately 100kg. 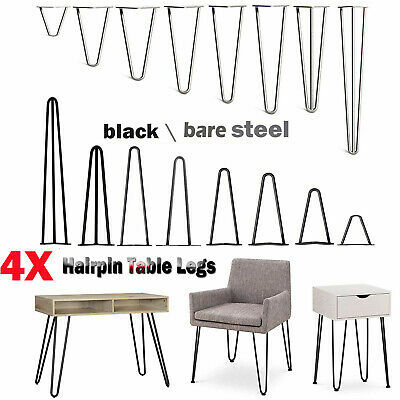 Technical Specification Furniture: 34 Inch / 860mm 4 Inch / 100mm 8 Inch / 200mm 10 Inch / 250mm 12 Inch / 300mm 14 Inch / 355mm 16 Inch / 400mm 28 Inch / 710mm 34 Inch / 860mm 40 Inch / 1010mm Base Size: 110x110mm; 6mm holes Availabile Finishes: Steel Diameter Prongs Max Weight 10mm 3 prongs 50kg 12mm 3 prongs 100kg > Steel Diameter 10mm 12mm Prongs (recommended) 3 3 Max Weight 50kg 100kg BAR OF POSEUR We recommend 40 inch, 3 prong, 12mm. At this length, we only suggest using the 12mm, 3 prong legs. 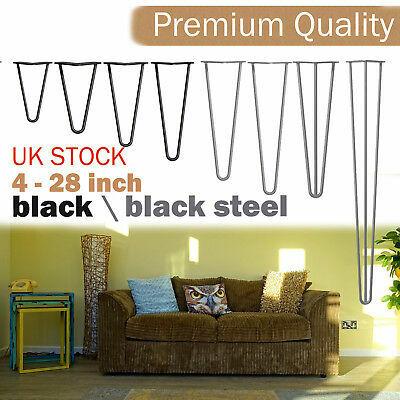 All other options do not provide the stiffness which is required for a tall bar or table. 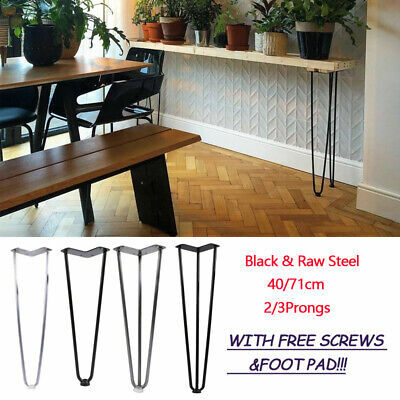 The bar height legs can support up to 80kg free standing, but more if you fix the table to the wall or another static fixing. 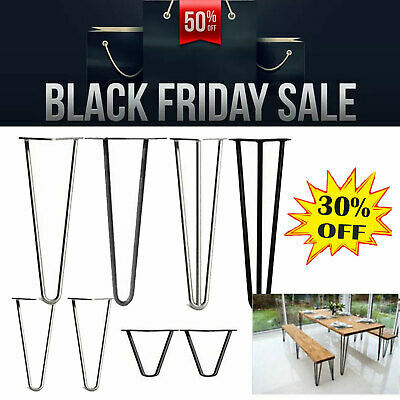 Technical Specification Furniture: 40 Inch / 1010mm 4 Inch / 100mm 8 Inch / 200mm 10 Inch / 250mm 12 Inch / 300mm 14 Inch / 355mm 16 Inch / 400mm 28 Inch / 710mm 34 Inch / 860mm 40 Inch / 1010mm Base Size: 110x110mm; 6mm holes Availabile Finishes: Steel Diameter Prongs Max Weight 12mm 3 prongs 80kg Steel Diameter 12mm Prongs (recommended) 3 Max Weight 80kg OUR CUSTOMERS We pride ourselves on happy customers – from choosing the right legs, to the finished result. Thanks to everyone who has sent in photos of their projects! Trade customer? Commercial project? We're here to help you! Get in contact to disscuss your project, We can help supply your commercial project, with quick turnaround and a huge range of stocked items. Custom requests welcomed. Get in touch for trade inquires FREQUENTLY ASKED QUESTIONS SHOULD I USE 2 ROD OR 3 ROD LEGS? 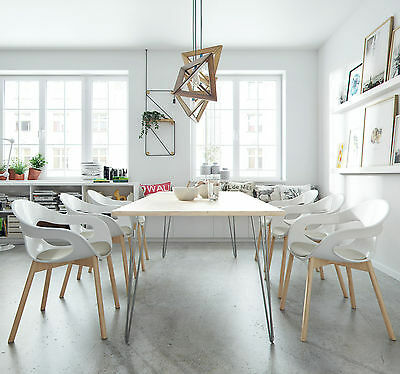 While 2 rod legs are strong enough to support the majority of projects, 3 rod legs add stiffness and stability for large – or heavily used – furniture. 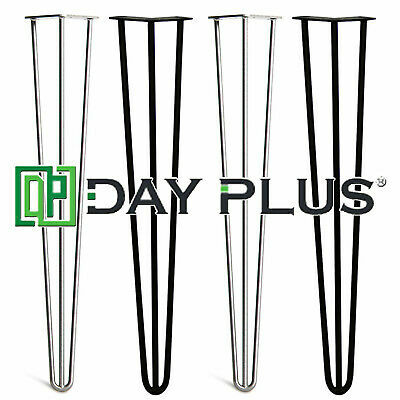 We recommend 3 rod legs for the following: Bench/16 inch:If your bench needs to support more than three people. 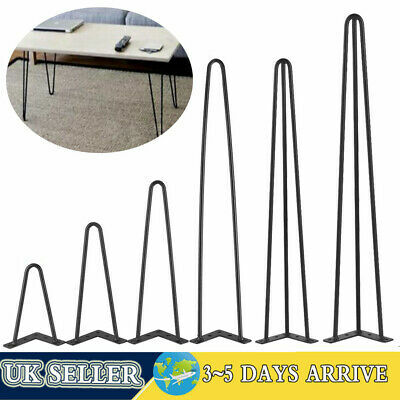 Desk or dining table/28 inch:We recommend 3 rods for added stability. 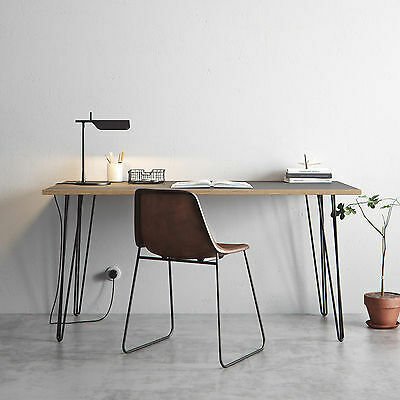 However, 2 rod legs are suitable for small desks, as long as the top weighs less than 20kg. 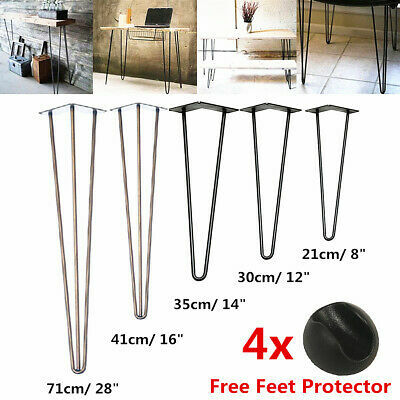 Console table or bar/34 inch+:The longer the legs, the more they flex. For this reason, we only provide our 34 inch legs in 3 rod. Whats the difference between 10mm or 12mm? 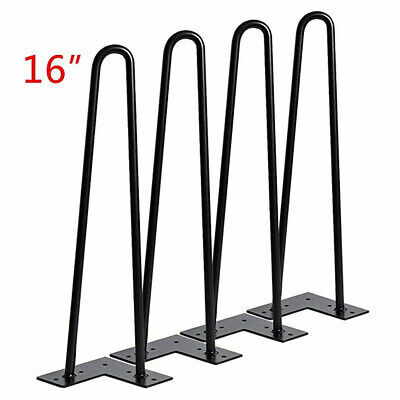 If your buying legs less than 28inches / table height then 10mm is almost definitely going to be strong enough for your needs. They can support well over 200kg - more than we can safely test to! 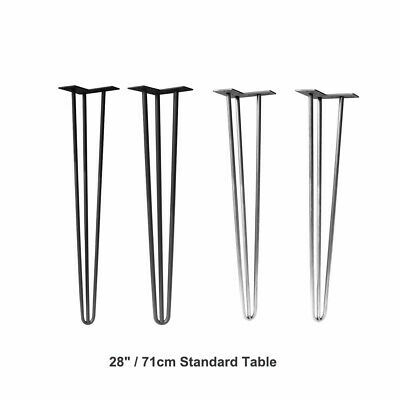 For desk and dining tables - If your table weighs more than 60kg then we suggest choosing the 12mm legs in the 3 prong version. 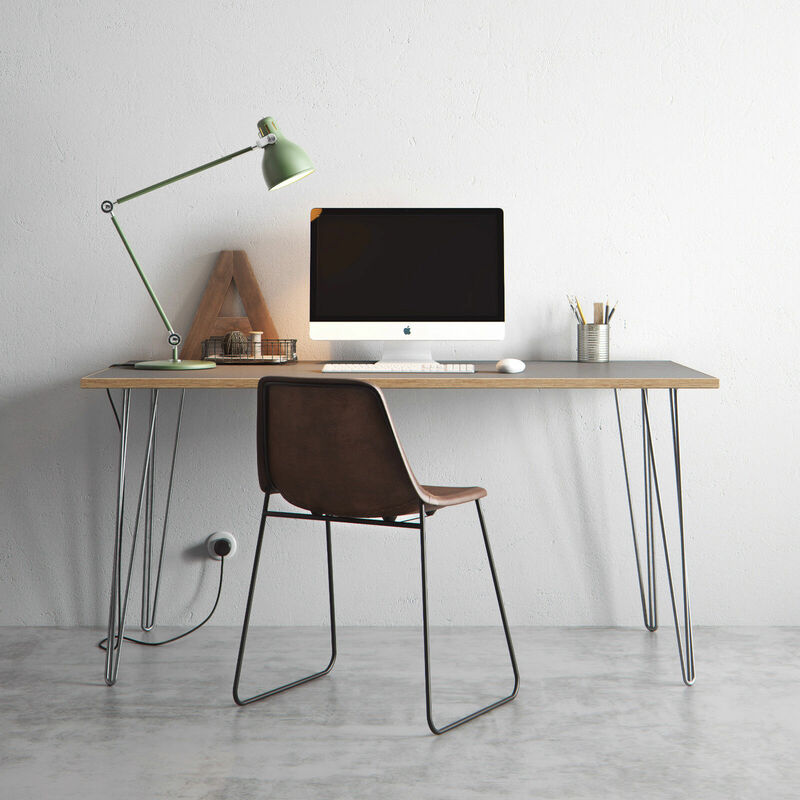 If you love the 2 prong look then 12mm can help you here too, allowing the creation of sturdy desks and dining tables up to around 25kg. 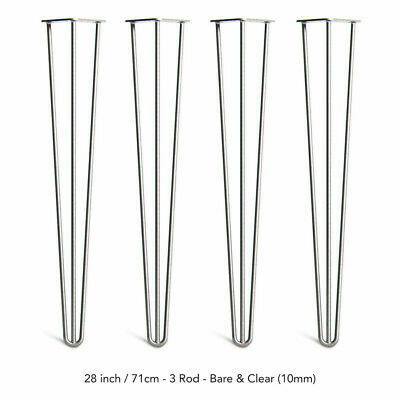 We also make a set of bench height legs in 12mm just so you can have a matching set for your table, if required. Do you do trade discounts? Yes, please do get in touch for larger orders. We can provide a good trade discount and fast lead times on most items. What fixings should I use? All our legs come with free wood screws. They’re suitable for good- condition solid wood, thicker than 18mm. If your wood is a bit rotten (old scaffold boards, for example), try to use the longest screws possible. If the wood is really rotten, we suggest putting a nut and bolt the whole way through, to ensure safety. Or find another piece of wood! For thinner tops (down to around 10mm), we suggest using threaded wood inserts. Can I buy less than 4 legs? Sorry – we make and finish our legs in sets of four. Delivering them in different quantities creates a lot of odd legs around the workshop, which is a bit of a nightmare! Can you produce custom orders? 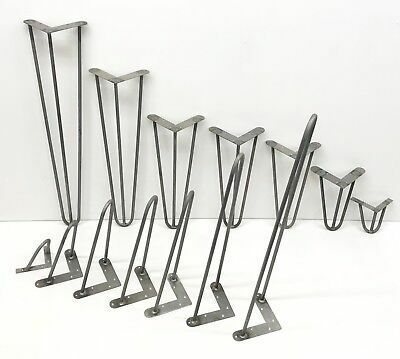 We can manufacture legs to any shape, size and length with a surprisingly fast turn around. Please get in touch to discuss your project Do you ship to my country and how quickly? We ship all our items worldwide. Shipping is calculated at the checkout, based on your location and total weight of your order. All orders are dispated on the day of ordering and we provide next day delivery in the UK as standard. For the rest of Europe delivery is approximatly 3-4 days. Worldwide orders will be received in most places in less than 7 days. ABOUT Who We Are We’re Adam and Tom, an English design duo dedicated to crafting quality handmade furniture. 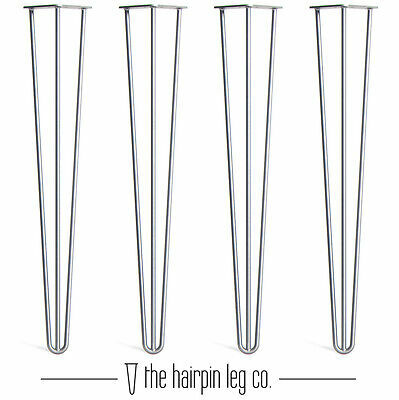 The Hairpin Leg Company grew from humble beginnings. We started out in the workshop, using Adam’s granddad’s old welder to create our first sets of steel legs. Fast forward to today. 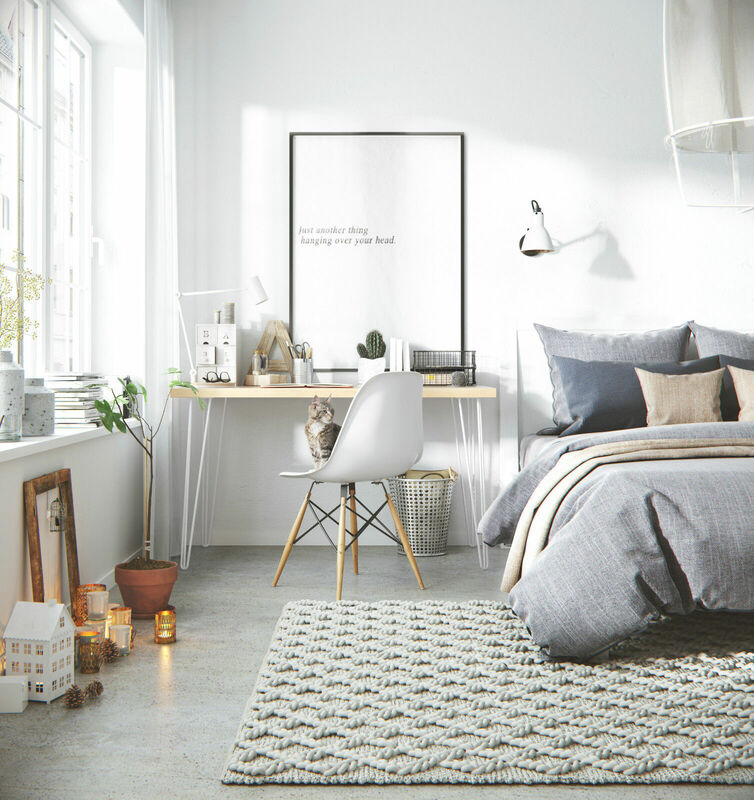 Having had the pleasure of working with a breadth of hugely talented people who've helped drive us forward, we’re delighted to deliver our designs all over the world! 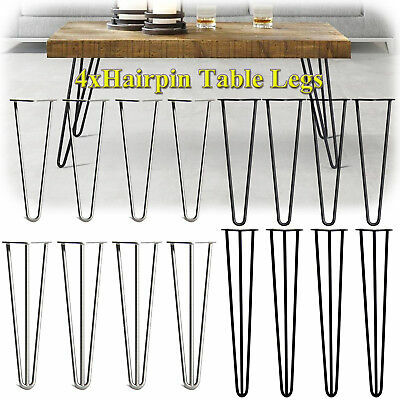 Why We Love Hairpin Legs As design fanatics, we love unique items that marry form with function. Hairpin legs do exactly that. Invented by Henry P. Glass in wartime Britain, they were a stylish solution to the need for sturdy furniture legs made with minimal materials. 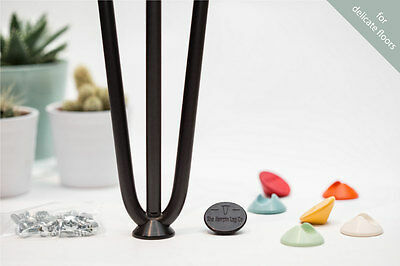 The slick simplicity of our pins makes it easy for anyone to transform everyday objects and recycled materials into functional furniture. And honestly, nothing makes us more proud than seeing the results once you get your hands on them. IF YOU’RE HAPPY, WE’RE HAPPY We are very proud of our products and if you're not 100% happy you can send the legs back to us for a full refund within 60 days - No Questions Asked! 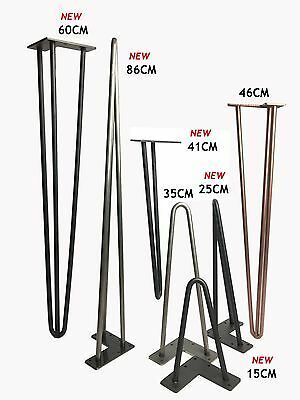 You may also like Industrial Tables Shelving © 2017 THE HAIRPIN LEG CO. All Rights Reserved. 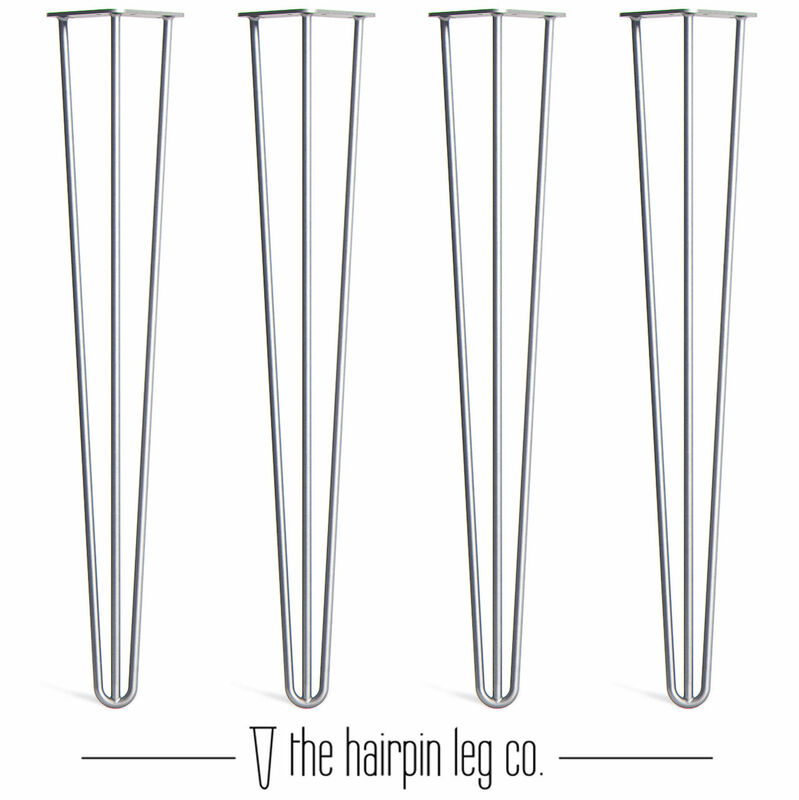 4 x Premium Hairpin Legs by The Hairpin Leg Co. 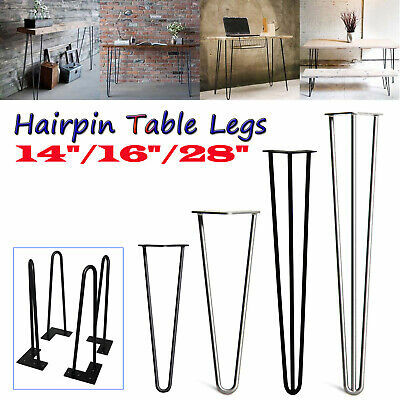 The UK and Europes best selling hairpin legs. Top rated for quality and customer service, 4 years running. Be sure to click view full description to find out what makes ours the best. 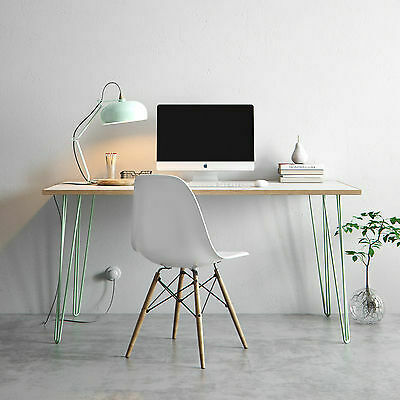 Condition: New, Room: Home Office//Study, Other uses: Bench , Seat , TV stand, Table, Desk, Cabinet, Country/Region of Manufacture: United Kingdom, Style: Vintage/Retro, Material: Metal, Base Size: 110mm x 110mm, Type: Table leg, MPN: 1000302-02, Main Colour: Bare/Raw Steel (100% Natural), Clear Coat, Black, Height: 4", 8", 10", 12", 14", 16", 28", 34", Brand: The Hairpin Leg Co. Popularity - 262,623 views, 195.0 views per day, 1,347 days on eBay. Super high amount of views. 23,514 sold, 2,394 available. 262,623 views, 195.0 views per day, 1,347 days on eBay. Super high amount of views. 23,514 sold, 2,394 available. Seller - 5,396+ items sold. 0% negative feedback. Top-Rated Plus! Top-Rated Seller, 30-day return policy, ships in 1 business day with tracking. 5,396+ items sold. 0% negative feedback. Top-Rated Plus! Top-Rated Seller, 30-day return policy, ships in 1 business day with tracking. 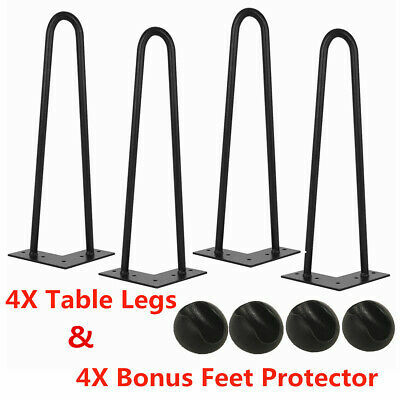 Premium Hairpin Table Legs Set of 4 + FREE Screws & Protector - No.1 Specialist! 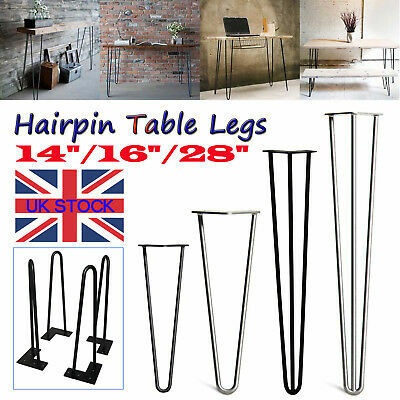 4 x Hairpin Legs / Hair Pin Legs Set Furniture Bench Desk Table in Steel 8~28"
Clearance 4 x Hairpin Legs Clear Coat & Black Coat - 10" 12" 14" 16" 28"
4 x Hairpin Leg Floor Protector Feet by The Hairpin Leg Co. - All Colours. 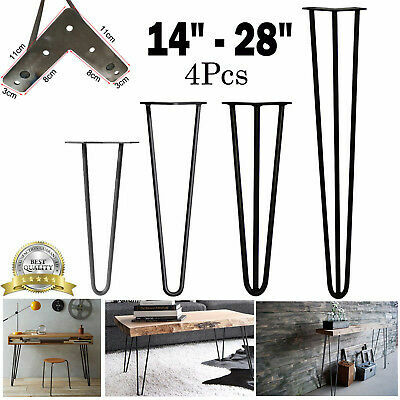 Set of 4pcs Industrial Retro Hairpin Table Legs Steel Bench Desk Leg 8" - 28"
Set Of 4 Industrial Hairpin Dining Coffee Table Legs Stool Desk 2 / 3 Rod 4" 28"
4x Premium Hairpin Table Leg Standard Feet Height 2 3 Rod 10mm Steel 14" 16" 28"